Hotspot Shield is one of the oldest VPN projects in industry. Started by AnchorFree, Inc in late 2008 as a web browsing security software for their hotspots, it promptly transformed into the largest VPN in the world. It even has won the 2013 Appy Award for Best Online Security and Privacy Application. Such an incredible growth of popularity is explained by the two facts: first of all, from the very beginning Hotspot Shield was offering both free and paid versions. Free version was quite functional – it has all the features of paid version besides virtual location selection. However, it should be noted, that users of free version of Hotspot Shield paid AnchorFree by necessity of watching commercials during the session. 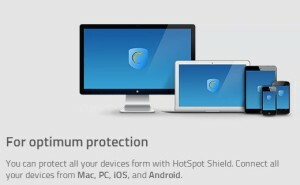 The second reason of Hotspot Shield popularity is the modest price of paid version. It was 40-60% lower than comparable products’ prices of the closest competitors during the 2008-2012 time period. Hotspot Shield VPN supports Windows, Mac OS, iOS and Android operating systems. However, you will not be able to find Hotspot Shield on Windows Store, so it is not available for Windows RT users yet. iOS: You can download it from iTunes / Apple AppStore. However, do not expect it to be installed in your AppleTV, because it works as VPN Profile which is being automatically setup by Hotspot VPN App. Android: All known Android 2.0+ and 4.0+ devices are supported except of Chromecast, GoogeTV and similar devices with capped version of Android. Our readers report about some compatibility issues with Samsung Galaxy Note devices. Although, you will not be able to install Hotspot Shield on some exotic devices like WII, it works well on iPads, iPhones, Android phones and tablets, PCs and MACs. Needless to say, you cannot use Hotspot on your Xbox, PS4, Roku, Dune, BRDP and other similar devices and players. Eventually, you cannot use Hotspot VPN settings for your Wi-Fi router, so you will have to setup Hotspot on each device separately. Good news: if you bought paid version of Hotspot Shield one account is enough to have the VPN installed on five of your devices, which meets the average needs of modern household. The main disadvantage of Hotspot Shield Free is very intrusive and annoying ad banners you have to contemplate every time you use it. These banners pop-up in such an unpredictable and importunate manner that one gets the impression that the general purpose of these commercials is to force the user to buy paid version, not to monetize the free one. However, such a twisted strategy works great: Hotspot Shield VPN has the largest number of paid subscribers in the industry. Unfortunately, you will not be able to use the free version of Hotspot Shield on iOS devices, such as iPad and iPhone, just because Hotspot VPN application is not available for free downloading on iTunes / AppStore: it will cost you $4,99 / months. You will pay $ 29,95/year for Hotspot Shield Elite, which costs exactly as the appropriate annual plan of Spotflux Premium VPN. There are other payments plans available: $19,95/per 6 months and $4,99/per one month. The last one is two bucks more expensive than Spotflux and $1,50 cheaper than HideMyAss. As the most of the VPN providers Hotspot allows up to 5 devices connected to one account. So, you may use Hotspot VPN on your iPad, a couple of phones and two computers while still paying only $29,95 a year. There are four payment methods available which may differ from country to country: PayPal, credit cards, cachU and rixty. Unfortunately, you cannot get a refund in case you are not satisfied with Hotspot VPN service. However, you may cancel you membership anytime you want, just from your account. As a result: all the recurring payments will be stopped, as well. Hotspot Shield assigns you a new IP address almost each time you are are reconnecting to their VPN. However, in one case out of ten we were deemed as “Anonymous Proxy” while trying to access some geo-restricted video services located in USA. So, it looks like some IP addresses form Hotspot servers pool are well known to proxy/VPN detectors. While IP address is being assigning randomly to you by Hotspot servers, you may select the country where you want your IP address to be located. You can choose from USA, UK, Australia and Japan. This option is not available for the users of a free version of Hotspot Shield VPN, which provide you with US based IP addresses only. Enormous popularity of Hotspot Shield Free caused a bandwidth limitation on 17 June, 2013 for all the Android, PC and Mac users of the free version. AnchorFree has explained such an unpopular decision by the unnecessarily high maintenance costs of free version bandwidth which exceeds 50% of total bandwidth of all Hotspot Shield users including paid and free version. Now, free version users see a “Payment Wall” when traffic exceeds 256MG per day for Android or 750MB per day for PC/Mac. The same “Payment Wall” appears immediately when the free version user is trying to access video services like Hulu or Netflix due to the high share of bandwidth consumption of these websites among others. Hotspot Shield has a simple interface that is intuitively understandable even for those who are not “computer-savvy”. The software runs in background mode: PC and Mac users can easily toggle it ON/OFF from System Tray, where IP address location country can be selected, as well. iPhone and iPad user can manage Hotspot Shield connection from Hotspot VPN application and switch it OFF/ON from Settings tab as it installs as preset VPN profile. There are some unnecessary settings available for those who want to adjust Hotspot Shield manually: you can set if Hotspot has to warn you when you connect to an unknown network or just connect automatically; you can select preferred interface language and choose the way Hotspot behaves when you restart your computer. We have encountered 12 disconnections during three 24h sessions of Hotspot Shield Elite launched on three servers located in different countries. In accordance with our rules, every 10 disconnections within 24 hours subtract one point, therefore, Hotspot Shield gets 4 out of 5 for connection stability. Our connection speed tests resulted in 6.18 Mbps average for Hotspot Shield Elite and 3.28 Mbps for Hotspot Shield Free versions, making Hotspot one of the fastest VPNs among competitor of the same price range. 5 out of 5 for Hotspot VPN connection speed. AnchorFree (the owners of Hotspot Shield) is American company headquartered in Silicon Valley, California; therefore, it has to report about users under USA PATRIOT Act. In addition both free and Elite versions of Hotspot Shield logs some information about users for, as they say, marketing purposes. In order to test Hotspot Customer Support, we have created one support ticket as free version user and two tickets as Hotspot Elite account users. In next 24 hours, all of the tickets were answered by Technical Support Staff member “Dmitry” (practically all at the same time). Although all our assistance requests were answered in a professional manner, there were not customer service telephone number given to ask some clarifying questions. Moreover, the only way to get some help is Hotspot Shield Help Desk a Zendesk platform page – no other options provided. Therefore, 4 out of 5 for Hotspot Shield customer assistance quality. Hotspot Shield VPN is fast and reliable solution from the industry leading company. However, be ready to pay for Elite version in order to get the access to all the features and get rid the annoying commercials. Moreover, you have to pay for Hotspot Shield if the purpose is getting the access to Netflix or Hulu services. It makes Hotspot Shield VPN vulnerable to competition from other VPNs that have more “user-friendly” conditions of free and trial versions. You advertise guarantee refund.Well can you explain why you say on this page that you do not give refunds.